?Simultaneous play: 2 to 4 players play their cards at the same time to rack up kills during the annual “Festival”! 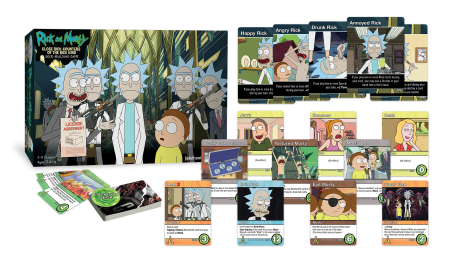 Cryptozoic Entertainment and Cartoon Network Enterprises announced the limited release of Rick and Morty: The Pickle Rick Game at San Diego Comic-Con, July 19-22, and Gen Con, August 2-5, followed by a full retail release this September. Cryptozoic also plans to make a limited quantity of the game available for purchase on its eStore during the summer. In the game, one player plays as Pickle Rick as he tries to escape a heavily armed compound, while the other player takes on the roles of both the Russians and Jaguar as they try to stop him. The Pickle Rick player uses weapons cards to dole out damage and Air Vents to get out of jams as he or she tries to get to the Rooftop. The Pickle Rick and Jaguar miniatures are moved across a dynamic board made up of tiles that are constantly being added, rotated, and flipped. Once play is over, everything can be placed right back into the Pickle Rick game case. 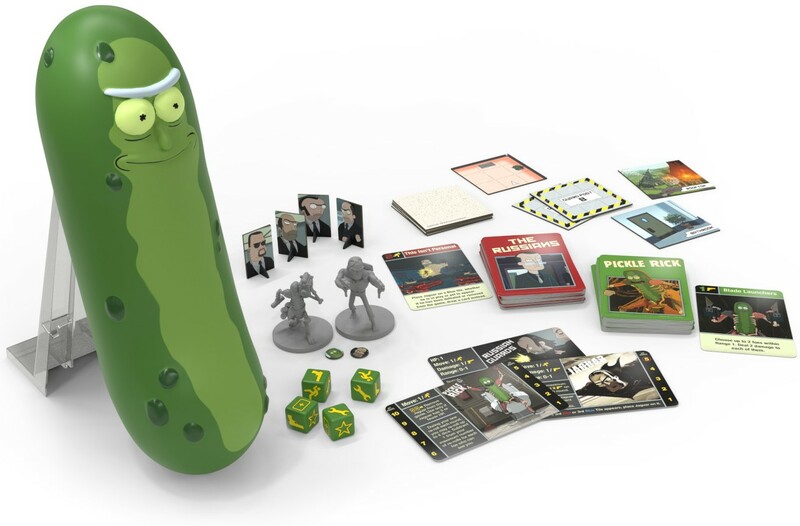 Rick and Morty: The Pickle Rick Game will initially be available in limited quantities at Cryptozoic’s Booth #115 at San Diego Comic-Con, at Booth #601 at Gen Con, and via Cryptozoic’s eStore. It will subsequently be available at retailers nationwide this September for a suggested retail price of $45. 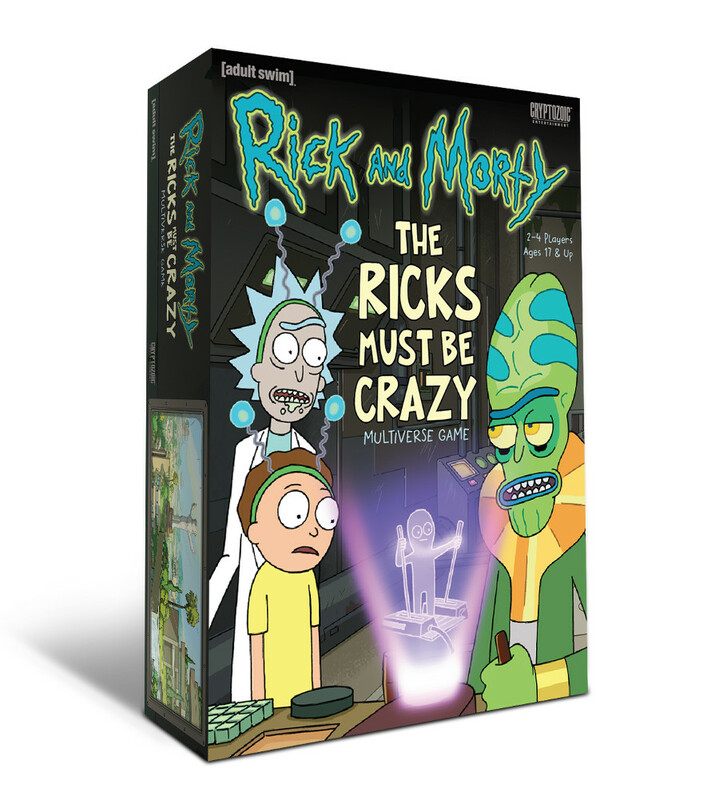 Announcing The Ricks Must Be Crazy from Cryptozoic and Cartoon Network. Cryptozoic Entertainment and Cartoon Network Enterprises announced the May 30 release of Rick and Morty: The Ricks Must Be Crazy Multiverse Game. In this engine-building tabletop game, 2-4 players take on the roles of Rick, Morty, Zeep, and Kyle as they introduce Power Supplies to different worlds, and then try to use the resulting Power to activate Contraptions before their opponents. Based on the Rick and Morty episode “The Ricks Must Be Crazy,” gameplay takes place in four “’Verses” with unique attributes: the Rickverse, Microverse, Miniverse, and Teenyverse. Cryptozoic Entertainment and Cartoon Network Enterprises announced the November 15 release of Rick and Morty: Close Rick-Counters of the Rick Kind Deck-Building Game. 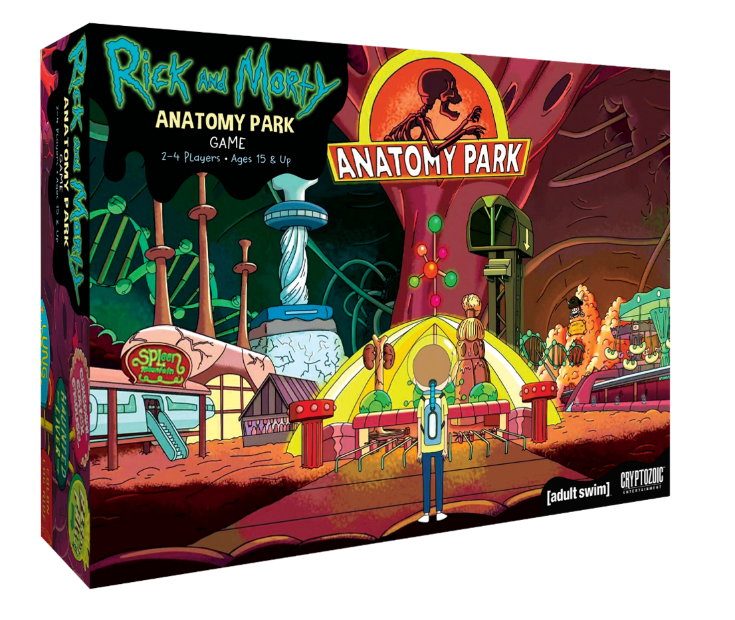 Based on the Season 1 episode of Adult Swim’s hit series Rick and Morty that features a multitude of Ricks and Mortys from different realities, the deck-building game allows 2-5 players to become various versions of Rick as they try to take down the Council of Ricks and Evil Rick. 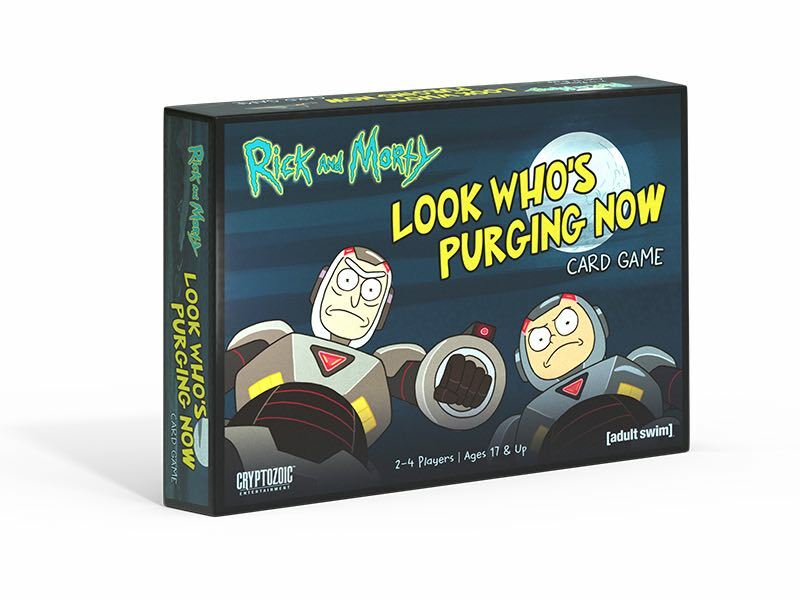 This competitive game utilizes Cryptozoic’s popular Cerberus Engine in new ways, as players use Portal Guns to access the otherworldly Location deck, which includes many of the bizarre places Rick and Morty visit in the fan-favorite TV series. In the game, the Location stack features many of the outlandish worlds Rick and Morty travel to in “Close Rick-Counters of the Rick Kind” and other episodes from the series. Each time a player employs a Portal Gun, he or she may flip up the top card of the Location deck and utilize that Location during his or her turn. 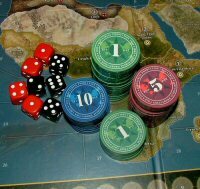 The player even has the option to pay the cost of the Location to add it to his or her deck. 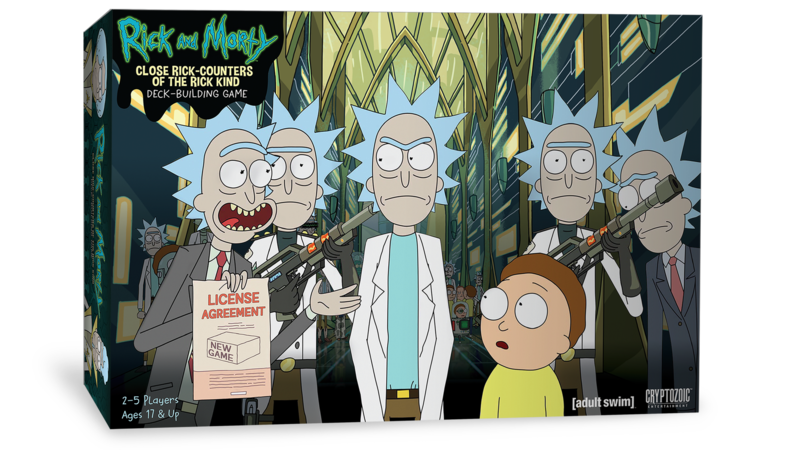 Rick and Morty: Close Rick-Counters of the Rick Kind Deck-Building Game will be available at retailers nationwide November 15 for a suggested retail price of $40. The first run of the game will include a “Promo Rick” oversized Rick card in every box. 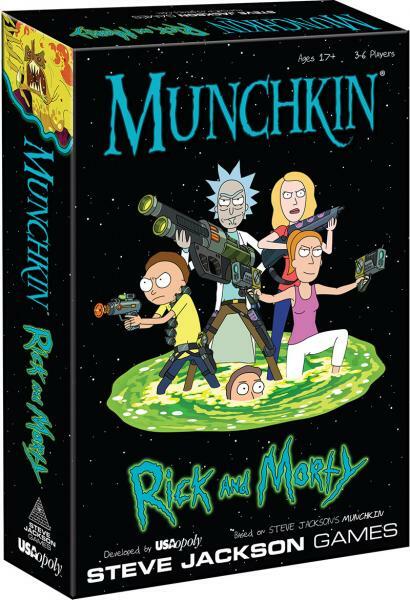 Gear up for a load of new adventures with your favorite dysfunctional super genius and his, uh, grandson Morty. You want demons? Got those. You want aliens? Check! All that and a whole lot more, coming soon to a game and toy store near you! Munchkin: Rick And Morty from Steve Jackson Games fuses the classic card game fun of monster-slaying and role-playing with cyborgs, aliens, and demons from the popular television series, Rick And Morty. Play as Rick, Morty, Beth, Jerry, Summer, or Mr. Poopybutthole to defeat the greatest adversaries in the Rick and Morty universe and become the hero as you reach Level 10 for the win.